Come and join us tomorrow evening, Friday, November 9 at 6:30 p.m. as we greet the Sabbath with beautiful song, quiet prayer and inspiring words of Torah. Better yet, come at 6:15 and we’ll start by singing a few niggunim and enjoying some food and drinks too. Together we’ll be lifted up! PLEASE NOTE: we will have our regular Mincha/Kabbalat Shabbat/Maariv service at 4:30 p.m. in the Goldberger Chapel. 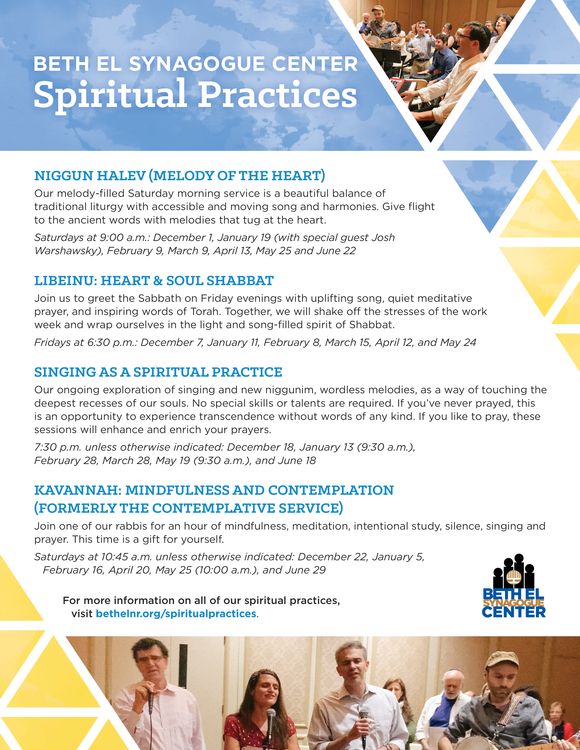 For more information on all of our singing services see the below flyer and visit bethelnr.org/spiritualpractices.